Reading the Bible has been a privilege and joy to generations of people down the centuries. 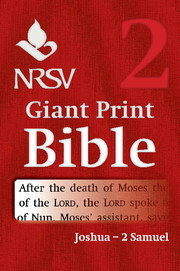 For those with impaired vision or failing eyesight, the large bold print of this Giant Print Bible means that they can continue to read the Scriptures for themselves. First published in 1989, the New Revised Standard Version is the most accurate and up-to-date translation of the Bible available. For the first time, those who need a giant-print Bible will be able to read the Scriptures in a truly modern version. There are three volumes for the Old Testament and a further volume for the New. Each volume is bound in a sturdy imitation leather, stamped in gold on the spine and the front. The four volumes are presented together as a set in a presentation box, ideal for personal use or as a gift.